A new member of the Winkelmann Heating+Water division, Sinusverteiler, presents its product range. Sophisticated solutions in hydraulic distribution technology, in particular compact system solutions and innovative system components will redefine your options in MEP engineering (heating- and cooling systems). 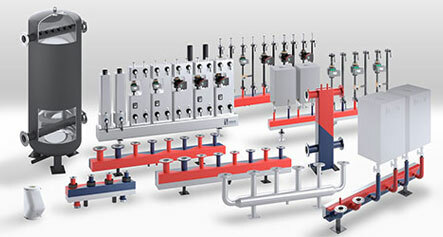 Sinusverteiler products are already connected with Reflex components and solutions in many boiler rooms and make the system offer even wider. Heating manifolds, low loss headers, compact system solutions, manifold fittings, individual buffer tanks, multivalent distribution and tank components, cascades, insulation caps.